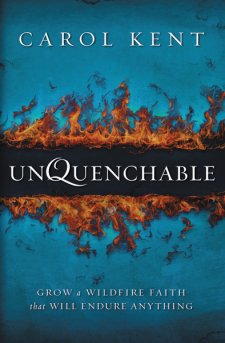 Unquenchable asks honest questions about disappointment in God and uses illustrations fleshed out from Scripture to look for purpose in suffering. It doesn’t try to resolve disillusionment with pat answers, but provides reflections on suffering that draw the reader deeper to the heart of God and to a faith that is unquenchable. I could not put this book down. It brought a soothing rhythm to the ebb and flow of faith and a reassurance that God’s love for us remains strong when circumstances state otherwise. (Click to Tweet) Carol Kent shares from her own heart-wrenching story as well as that of others who encounter the unthinkable and have to find a new way to carry on with life. She provides steps to feed your faith and to overcome our natural inclination to complain in the midst of strife. She illustrates the importance of tending the fire, in order to have a faith that can step into the unknown and trust that God will be there. Kent reminds us that the Refiner’s fire is life-giving, though painfully so, and that suffering drives us to our knees, where we can find the secret of wildfire faith. Get this book! It will be one of your cherished go-to-books in times of despair and for times of growth! Thank you Bajurajutid. May you find the Lord here. This is my first visit to your blog, I get a lot of useful information from your blog. Thank You. It was an amazing book Cara. Hope you will get a chance to read it!